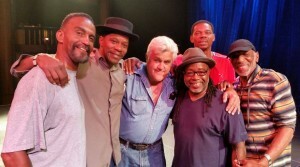 See you September 27 & 28 at the Cerritos Center for The Performing Arts; where my mom says,” Jay Leno will be closing for Street Corner Renaissance” (See calendar for details) As we take note of this milestone in our career, the fellas and I pause to give thanks. 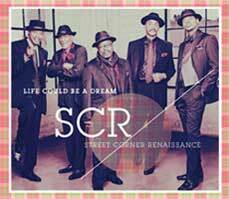 Street Corner Renaissance is living the improbable dream ( And loving it!) After opening for Kool and the Gang, Chuck Berry, Boyz 2 Men, Otis Williams’ Temptation and other musical icons, we now have the extreme good fortune of working with television’s perennial late night host and funny man, the legendary Jay Leno. So what’s the big deal? You ask. Well, considering we came to this party late in life, it’s a huge deal. One that we don’t take for granted. We’re five guys in our 50’s 60’s and 70’s, riding high on a natural high after being given a second chance to pursue our first love, singing. What an encore to the first act of our lives where the circumstances of our lives dictated that we did everything but what we were born to do. At a time when our friends and families are retiring, slowing down and dimming the lights; the future is extremely bright for us. We exist in a world without gravity, where nothing is holding us down. And so we pause to say THANKS to God, our love ones who stuck with and supported us along the way and to all of you that are helping to keep the dream alive.